Affirmations are a reminder of our values, worth, and goals. Being able to believe and speak greatness into our self is a beneficial tool when reaching our fullest potential. Identifying our purpose and affirming that purpose is a process that can be difficult to start. 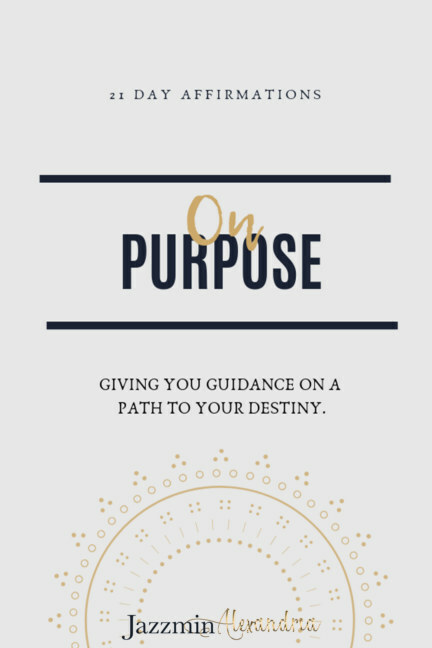 On Purpose is a 21-day affirmations guide angled to help you find your purpose. We live in a world where we are constantly told what we should do instead of being taught why we are here. This affirmations guide will help you identify your why, challenge you, and make you evaluate your current situation. The author Jazzmin Rodgers believes that every person has a purpose and a desire, but everyone does not reach that purpose. We can become so distracted by life, we forget it should be meaningful and lived to the best to our ability. If you are ready to start living in your purpose, this 21-day affirmations guide is the initial step for you. If you are realigning yourself, your purpose or fasting, this is for you as well.